Thorbjørn Jagland, the Secretary General of the Council of Europe (CoE), has always had a pro-Armenian stance and a biased attitude towards Azerbaijan, Hikmet Hajiyev, Azerbaijani Foreign Ministry spokesperson, told Trend June 18. He was commenting on the statement made by the press secretary of Armenian Foreign Ministry Tigran Balayan about the allegedly possible suspension of Azerbaijan's membership in the Council of Europe. 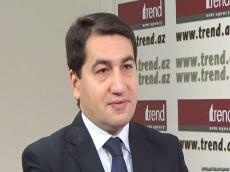 Hajiyev noted that thanks to the press secretary of Armenian Foreign Ministry, the general public learned about what everyone knew about Jagland on the sidelines of the Council of Europe. "It seems that the Secretary General of the Council of Europe has authorized the Armenian Foreign Ministry to speak on his behalf. Finally, all masks fell down," Hajiyev said. Earlier, Armenian media quoted Tigran Balayan as saying that Jagland has allegedly initiated suspension of Azerbaijan's membership in the Council of Europe. At the same time, Balayan noted that “this is quite a long-term process." However, Balayan didn’t explain about which process he was talking about.